Goodreads: Already widowed by the age of forty, Ilka Nichols Jensen, a school portrait photographer, leads a modest, regimented, and uneventful life in Copenhagen. Until unexpected news rocks her quiet existence: Her father–who walked out suddenly and inexplicably on the family more than three decades ago–has died. And he’s left her something in his will: his funeral home. In Racine, Wisconsin. 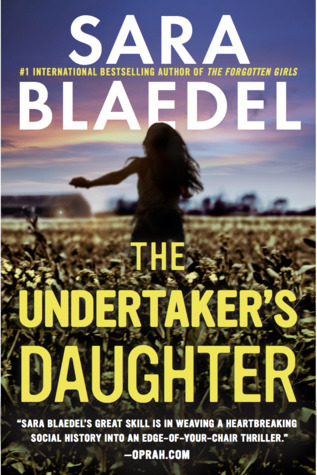 Kritters Thoughts: I am surprised to say that this is my first Sara Blaedel book; for being a mystery/thriller reader I would have thought I would have read her before. To put it short and sweet, this one didn't impress me, it was just bland. Ilka leaves Denmark when she comes to find out her father has passed and she has been named in some part in his will. She must go to Wisconsin to find out what is left to her and what she must do to close this chapter. Ilka's father had left her and her mother with a funeral home in Denmark and spoiler alert he has left her one in the states that is completely underwater and needs a lot of work. If you are a heavy reader like me, there are books sometimes that just on the ehh ok side and this one was that. The plot was fine and the characters were ok, but overall it was just an ok for me. I would not count out this author, but I would have to read another and completely enjoy it for me to continue on with her backlist. I read another review on this one and I was very intrigued. Now you've got me interested as well. Thank you for the review.